It seems like Skunk Week around here. The skunks have come by so often, they don’t even look up when I take a picture. 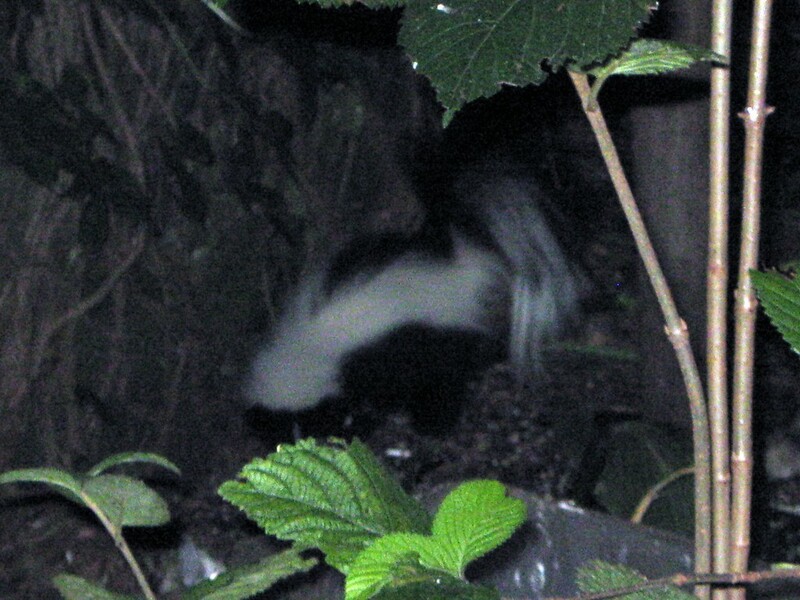 There was the night the two cutest little skunk kits came nosing around the garden while the evil cat skulked past other side of the garden wall. They were all fluffy, so they ignored each other. There was the night the sweet tabby cat strolled out back, only to find a big surly skunk. Puff. Hiss. This might have something to do with the morning we woke up and the whole world smelled like skunk. No, no the cats. Not us. Just the breeze coming in and the breeze going out, until the air finally cleared of skunk stink. Oh, yeah, it’s Skunk Week. Around here it’s groundhogs bearing fleas. They like to sun themselves belly-up on our deck. There’s no dogs to be tempted to chase groundhogs?